What I loved most about this book is how the author shines a light on fears and anxieties and the protagonist has the tenacity to attempt to face them head on against a backstory of ever-present fear. Esther Solar is paralyzed by phobias and superstitions - an unfortunate and debilitiating multi-generational family trait influenced by her grandfather’s supposed curse by Death. Esther dreads bad luck and is scared of discovering her worst ever fear which could ruin her life like other family members, so avoids most things and hides beneath elaborate movie character costumes each day in lieu of ‘regular’ clothing. Her whole family is also afflicted and live in their bubble of fear trying to get through each day. Esther's twin, Eugene has a morbid fear of the dark, their mother is extremely superstitious and an obsessive gambler waiting for a lucky win and their severely agoraphobic dad hasn't come out of the basement for six years. Esther's beloved grandfather is in a nursing home with end stage dementia and his backstory is paramount to the family’s ‘curse’. Hope enters Esther's life when she gets pick-pocketed by Jonah, a boy she once loved and lost in junior school who once again changes her life, even though his own home situation is traumatic. 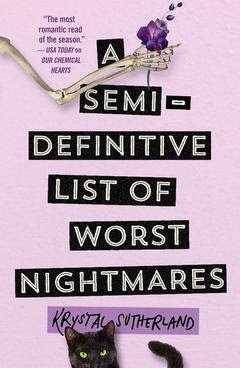 Jonah also steals Esther’s list of her 50 greatest fears and challenges her to facing one fear every week during their senior year. They tackle it with fast, sassy humour, a bit of drama and a couple of laugh out loud experiences. This book addresses emotional pain, the debilitating power of fears and mental health issues, yet it’s transposed on a backdrop of a trusting and caring relationship that’s a slow burn between Esther and Jonah. The characters and relationships are rich and beautiful and you’ll get swept along on a sometimes reality-bending tale which throws another angle into this multi-dimensional platform of irrational and rational fears and the almost catastrophic consequences they can have. Beautifully written with underlying depth, understanding and compassion. Krystal Sutherland, author of Our Chemical Hearts leaves no emotion untouched in her deep and funny and complex and sometimes heartbreaking prose.